IOCL Careers Making opportunity for all fresher unemployed candidates of India. IOCL Recruitment department issued an official notification on their official website related to this Recruitment process. We also shared the official notification from which we took this information under IMPORTANT LINK section. All the rights of the information which we shared in this article goes to the following website: “https://www.iocl.com”. 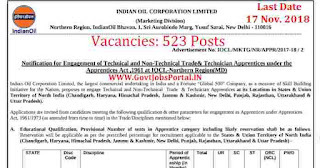 Under this website we found the PDF file which contains the whole information related to this Indian Oil recruitment process for Technical and Non-Technical posts. IOCL (Indian Oil Corporation Limited), is one of the major commercial organization undertaking by Government of India. 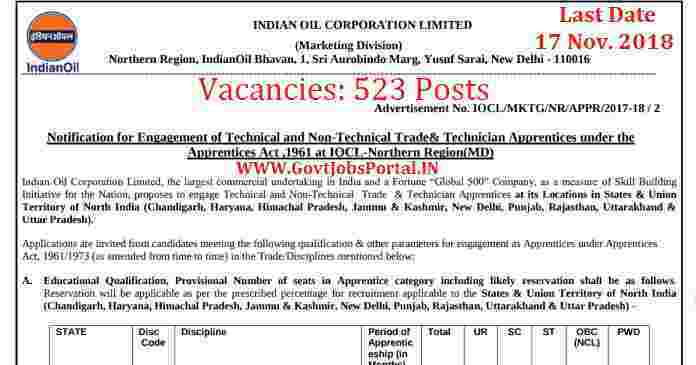 IOCL offers to engage Technical and Non-Technical Trade & Technician Apprentices at its Locations in States & Union Territory of North India (Chandigarh, Haryana, Himachal Pradesh, Jammu & Kashmir, New Delhi, Punjab, Rajasthan, Uttarakhand & Uttar Pradesh). More information related to this IOCL Careers making opening is given below in this article. Read it carefully before applying for this IOCL Recruitment process 2018. Those who have 3 years diploma in the respected trade with minimum 50% marks can apply for these job profiles under this IOCL Recruitment 2018. 10th pass and have 2 years ITI certificate in relevant discipline full time can apply for these job profiles. Those who have completed their Graduation in any stream with 50% marks can apply for these job profile. Age Bond: Applicants who are wishing to apply these Government jobs under IOCL Careers making opening must have age in between 18 years to 24 years. Those who lies in this age group can apply online for any of the above job profiles. ZERO Application fee for applying this IOCL Recruitment process 2018. So all eligible candidates can apply online without any application fee. 27TH Oct. 2018 is the Opening Date to apply. 17th Nov. 2018 is the Last Date to apply.